It is very uplifting to go to the garden on a cold December day to harvest a perfect, intricately woven, beautiful white head of cauliflower. “All Year Round” produces good quality white heads and is an excellent all-purpose variety for successional sowing. They hold well over large periods. The white, well-protected large curds are popular for summer shows, for freezing, and for use straight from the garden. If you give cauliflower a try, you will be rewarded with the mild, sweet flavour of this vegetable at its freshest. Cauliflower may be eaten raw in salads, steamed, or boiled. Cauliflower is a great source of vitamin C, potassium, protein, phosphorus, and very high in fibre when eaten raw. Sow Jan to Feb under glass. March to May outdoors and Sept to Oct in coldframes to over winter. All brassica crops grow best in partial-shade, in firm, fertile, free-draining soil. Start digging over your soil in autumn, remove any stones you find and work in plenty of well-rotted manure or compost. Tread on the soil to remove any air pockets and make the surface very firm. Brassicas will fail if the soil is too acidic so add lime to the soil if necessary, aiming for a pH of 6.5 to 7.5. Cauliflower prefers deep, humus-rich soil with a good supply of water and high humidity. Prepare your soil by working into it organic matter such as compost, bark, wood ashes, and manure. Barnyard manures should be aged before adding to the garden. Rabbit and chicken manures are good ones to use. Cow manure is good but just don't overdo it, as the manure may cause a build up of salt in the soil. If your soil is acidic, it should be sweetened up by adding lime. Sow 4 to 6 weeks before the date you wish to plant them outdoors. Nearly all brassicas should be planted in a seedbed or in modules under glass and then transferred. Seeds should be sown thinly, as this reduces the amount of future thinning necessary and potential risk from pests. Sow seeds 12mm (½in) deep and rows should be spaced 15cm (6in) apart. Once the seeds have germinated, thin the seedlings to 7.5cm (3in) between each plant. The seedlings are ready for transplanting when they are between 6 and 8cm high (2½ to 3in). Water the day before moving, and keep well-watered until established. Space the plants 45cm (18in) apart in rows 60 to 90cm (24 to 36in) apart. Plant only as deeply as the transplants are as they are removed from their containers. If you overcrowd cauliflower, they may not be able to reach their full potential. Provide two or three plants for each family member. As you plant, put about a cup of root stimulator mixture into each hole along with a teaspoon of bonemeal to get the plants off to a robust start with strong roots and stems. Mulch each plant to prevent soil erosion and to add nutrients to the soil as it decomposes. The meat of the cauliflower heads are called curds. The curds may "yellow" if they receive too much sun, rain, or frost. Secure the plants' long leaves over the cauliflower heads to insure beautiful white heads. Cauliflower needs rich soil and adequate moisture for peak production. Feed them with a nitrogen-rich fertilizer every two or three weeks until the point of production. Then feed them with a good water-soluble fertilizer. Keep the soil moist. Replace mulch as it deteriorates and pull weeds away from the plants. Harvest when the flower shoots are firm and well-formed. Cut close to ground level with a sharp knife. Cauliflower can be stored by freezing. Separate the flowerettes, wash them well, and put them into boiling water for 3 to 5 minutes. Remove them from the boiling water, then put them into ice water for a few minutes. Drain them well and put them into freezer containers and into the freezer. Cauliflower is a variety of the common cabbage in which flowers have begun to form, but have stopped growing at the bud stage. The same applies to broccoli. The thick stems under the buds act as storage organs for nutrients, which would have gone into the flowers and eventual fruits had their development not been aborted. All these types are therefore richer in vitamins and minerals than other brassicas. Rosemary, Thyme, Sage, Onions, Garlic, Beetroot, Chards. Plant celery near to Cauliflower to repel the white cabbage butterfly. Don't plant cauliflower near strawberries or tomatoes - it doesn't like either. Some time in the past thousand years, the preference developed in southern Europe for eating the immature flower buds of the cabbage plants. Selection pressure favouring production of plants with large tender flowering heads was imposed by some growers. 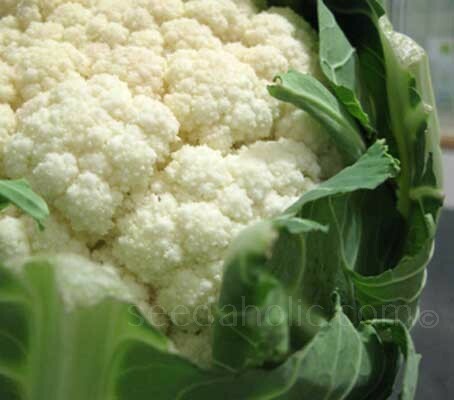 By the 15th century, the modern vegetable we know as cauliflower had developed and about a hundred years later, broccoli had been generated in Italy. The cauliflower plant was named by botanists as Brassica oleracea variety botrytis, with the last part of the name referring to the fact that a cauliflower curd is was thought to resemble a bunch of grapes. The Latin name Brassica derives from the Celtic ‘bresic’. The species oleracea refers to a vegetable garden herb that is used in cooking, while botrytis is a Greek word meaning ‘clusterlike’ or ‘grapelike’. Sept to Oct in coldframes to over winter.